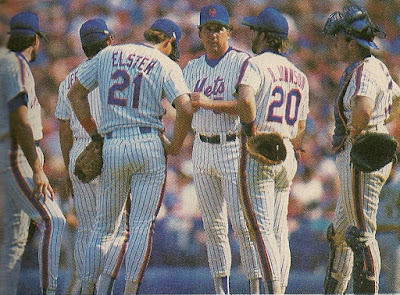 May 29th 1990: Things were starting to boil up early on in the Mets 1990 season, especially when they kept losing. This was a team who was favored to win the National League & the World Series almost every year from 1985 to 1990. The Mets won it all in 1986 but were second place bridesmaids & never again the bride. In a day & age with no wild card winner, they just went home to long winters. The 1987 Mets had won 92 games but finished three games behind St. Louis. The 1988 squad won the NL East but were upset by the Los Angeles Dodgers in the NLCS. In 1989 the team won 87 games, their lowest total of wins since 1983 & finished second behind the Chicago Cubs. At this point in 1990 the Mets were 22-20 & fell to fourth place. Davey Johnson was being criticized for not being a disciplinarian to the wild bunch. He was accused of not being able to motivate the team as he once did when they were younger & hungrier. Johnson was the games winningest manager over the past six seasons & had the most wins of any Mets manager in Mets history 595-417 with the best winning percentage as well (.588%). Many of the 1986 Champions were gone with just Darryl Strawberry, Howard Johnson & Tim Tuefel left in the line up. But the Mets pitching staff was still one of the games best with most of the '86 cast still on the team. Frank Viola would win twenty games in 1990 (20-12), Dwight Gooden (19-7) & David Cone (14-10). Ron Darling (7-9) & Sid Fernandez (9-14) both were struggling. John Franco was the teams solid closer (33 saves). Bob Ojeda (7-6) was pitching out of the pen as well as making 12 starts. 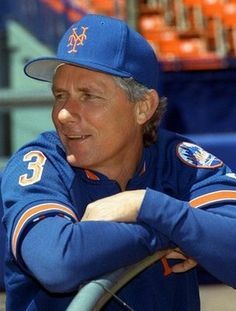 Mets third base coach, Bud Harrelson was named the 12th Manger in Mets history, replacing Johnson. Johnson had played for the Mets as one of the games best defensive short stops, winning a World Series with them in 1969 & a pennant in 1973. After his playing days he was the Mets third base coach & a face of the organization's history. The 1990 Mets won 91 games but finished second once again, it was their last winning season for the next seven years in 1997.